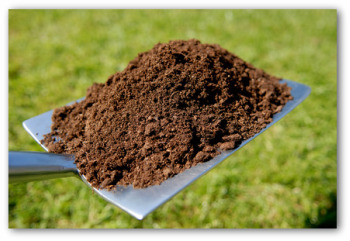 It is easy to create your own organic fertilizer recipe and make wonderful, rich compost to use in your garden. It is easy to make your own compost by creating an area for composting in your backyard or garden area. Simply recycle vegetable and fruit scraps from your kitchen into a compost pile or container, and add items such as leaves, grass clippings, coffee grounds, tea leaves, eggshells and any other organic items except meat or bones. Adding your own organic compost to fertilize your garden is a great idea when you are planting an organic vegetable garden for your family! 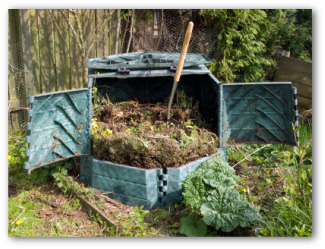 You will want to add a layer of dirt or grass clippings to the top of your compost pile after adding a layer of vegetable matter, to help speed up the process that converts your scraps and clippings into compost. Water each layer as it is added. It is also good to stir your compost pile occasionally, as both air and even-dampness are important in the composting process. Choose a spot that is in the shade, and still convenient for adding materials and removing the compost to put in your garden. Make sure the soil drains well where you place your compost pile or bin. You can make your own compost bin out of wood or wire. Or you can purchase a plastic container especially designed for compost. There are many to choose from that are attractive, and work very well for a small compost pile. 1. Create a first layer of "brown" materials. These may include dried leaves, sawdust, straw, newspaper or hay. 2. 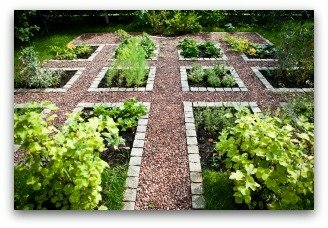 Next, add a layer of "green" materials like grass clippings, manure, weeds or fruit or vegetable scraps (do not include any kind of meat, bones, or fish scraps, as these will attract animal and insect pests to your compost area!). You will build your compost pile by repeating these layers of "brown" and "green" over and over. Be sure to add some water to each layer during hot weather or if your compost pile seems dry. 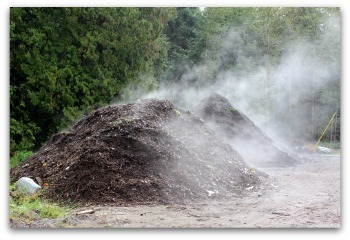 Dampness will help the composting process take place. The whole process of creating your own compost will take some time if you are building your compost pile gradually as you acquire materials. When your compost pile reaches the height of about three or four feet, it will have enough volume to start heating up, which causes the ingredients to breakdown and turn into rich brown compost. It is the perfect recipe for organic fertilizer! Once your compost pile has reached the size of 3 to 4 feet, mix the layers together well. Two days later, do it again. If you want to speed up the composting process, you can purchase special microbes at your local garden center or nursery that will get things moving a little faster. You will want to cover or protect your compost pile during weather extremes. This will help prevent your compost pile from getting water-logged or completely dried out. During dry weather, remember to water the compost pile occasionally. Keep turning it every few weeks. When you add new materials to your compost pile, remember that the smaller the pieces, the faster it will be for them to break down. Don't add meat, oil, weed seeds, or bones to your compost pile. Dairy products are also not a good idea to add to your organic fertilizer recipe. Many of these ingredients will attract flies and animals, and will create unpleasant orders. Your neighbors will not be pleased! If you purchase a "ready made" compost bin, you will want to follow the instructions that come with your bin. These bins are especially designed for smaller amounts of materials, and are great for home use. Leaf mold is another type of organic fertilizer recipe very beneficial for use in your vegetable garden. Again, you can create your own leaf mold, or purchase it already made. Leaf mold is made up of decomposed leaves, with no other additives. Simply pile all of your dried leaves in one pile, and allow them to break down naturally. This organic fertilizer recipe will take some time. Leaf mold resembles compost, in that the finished product is dark brown and crumbly. It is not used as a fertilizer per se, as it is not especially rich, but is a wonderful soil conditioner that greatly helps your garden soil retain water. So if you are preparing an in-ground vegetable garden, you might want to create your own leaf mold alongside your compost pile. If you don't have enough of your own compost to use as fertilizer for your garden, you can also purchase bags of sterilized manure or dairy compost at your local garden center. Or perhaps you know a farmer who has an old pile of decomposed straw and manure from his barn. Before using this type of organic fertilizer, be sure that the manure is at least two or three years old. Using fresh manure will "burn" your plants, and will also create unhealthy bacteria in and around your plants. 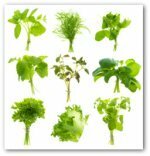 One drawback to finding your own source of farmyard fertilizer is that you will notice you have a lot more weeds sprouting in your garden if you use un-sterilized manure as fertilizer. The sterilizing process is designed to kill weed and other seeds that are found in manure! So if you want to save money this way, be prepared to do some extra weeding. Follow one of these organic fertilizer recipes and see for yourself what happens. 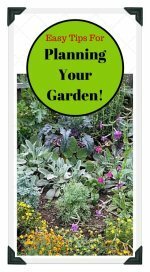 Be sure and sign up for our newsletter for more tips on getting the most from your garden!